Welcome to Wil Lloyd's Website! The small Machynlleth-based abbatoir in which the meat is prepared was built by the Ministry of Agriculture in 1950, and then purchased by my Grandfather 9 years later. In more recent years, a Processing and Marketing Grant with Welsh Assembly Government funding has helped to support a full and radical modernisation of the facilities. The new facilities include a cutting and processing area where we make our speciality sausages, and a large cold store fitted with a state of the art refrigeration plant. This allows me to hang beef in sides to mature for up to five weeks. Previously, I had to cut the carcasses and could only keep them for a maximum of two weeks. 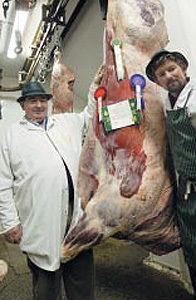 The photo shows my late father (L) and myself with a prizewinning carcase.